A gluten-free treat. 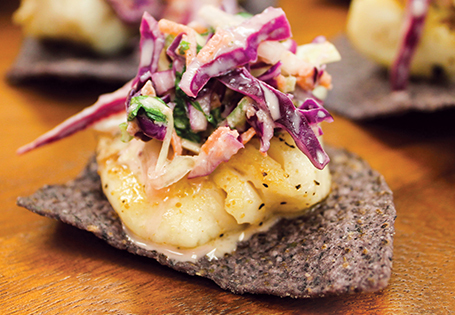 Pan-seared tilapia on a blue corn chip with coleslaw. In a medium bowl, combine the coleslaw dressing ingredients. Add the red and green cabbage, carrots and cilantro. Toss thoroughly. Season tilapia fillets with salt and pepper, to taste. In a large nonstick pan, heat oil over medium-high heat. Add crushed red pepper, ginger and lime zest. Pan sear each fillet 1-2 minutes per side. Arrange tortilla chips on a large platter. Top each chip with a piece of tilapia and coleslaw. Serve immediately.